The West Coast Eagles is committed to promoting awareness and understanding of diversity through inclusion and support of Aboriginal and Torres Strait Islander communities. In 2014 the Club developed a Reconciliation Action Plan (RAP) to demonstrate this commitment. The development of the RAP involved the review of all existing Aboriginal and Torres Strait Islander relations commitments, the formal establishment of a representative RAP working group, collaborative and consultative engagement of staff across our organisation, including Aboriginal and Torres Strait Islander staff and other key community and corporate stakeholders. In 2015 the Club implemented their second RAP, in partnership with the Wirrpanda Foundation, aiming to build on the first plan and expand on the existing commitments. Our club’s second Reconciliation Action Plan from May 2015-May 2017 was developed in partnership with the Wirrpanda Foundation. This Reconciliation Action Plan was built on the solid foundation of the inaugural plan, with input and feedback from the Reconciliation Action Plan Working Group and Wirrpanda Foundation staff to extend our commitment to Reconciliation. 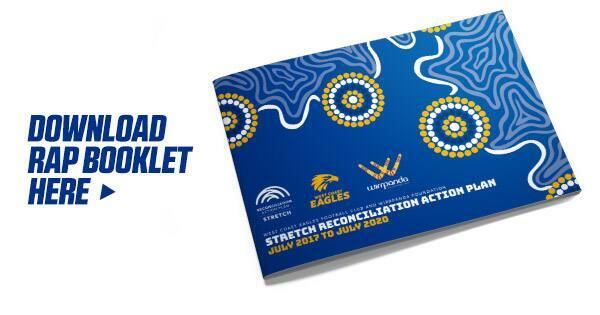 This third phase will see the West Coast Eagles and the Wirrpanda Foundation move to implement a ‘Stretch’ Reconciliation Action Plan that will build on the achieved objectives of the previous Reconciliation Action Plans. In partnership with the Wirrpanda Foundation and BHP Billiton, the Club also actively celebrates AFL Sir Doug Nicholls Indigenous Round, which is held during one fixture of the season each year.